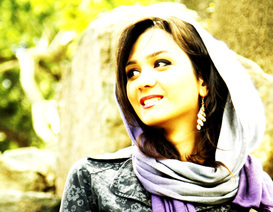 Negar Emrani was born on January 1st 1985 In Mashhad, Iran. Back then arranging the date of birth for an earlier time than the real birth date was considered by Iranian parents to be a smart way of being able to send children to school at﻿ an earlier age. So Negar’s ID was issued on September 2nd 1984. She now holds a BSc from Ferdowsi University of Mashhad and a MSc in Biotechnology from AUT-SRB.